Tesla and wind farm developer Deepwater Wind are planning to team up to create the largest project in the world that combines an offshore wind farm with large-scale electricity storage, the companies announced Tuesday. The project, called the Revolution Wind Farm, would generate electricity about 12 miles off the shore of Martha’s Vineyard, Mass., and store some of it in large batteries built by Tesla. The project would have the capacity to generate 144 megawatts of wind power, or enough electricity to power 80,000 homes, according to Deepwater Wind. If approved by the state, the wind farm would begin operating in 2023. It is expected to be built next to another wind farm proposed by Deepwater Wind called the South Fork Wind Project. That project would serve Long Island, N.Y. The companies proposed Revolution Wind as part of a call in Massachusetts for new sources of renewable energy across the state. The state hopes to generate more clean energy to meet its climate goals by cutting the state’s greenhouse gas emissions. Electric power plants running on coal and natural gas have historically been America’s largest source of carbon pollution contributing to climate change. This is the first time Tesla will use its batteries to store wind power. Revolution Wind brings together two new industries in the U.S. — offshore wind and electricity storage. The expansion and scalability of renewables depends in part on new ways to store wind and solar power, which today can only be used when the wind is blowing and the sun is shining. Big batteries are seen as a solution to that problem because they allow renewable energy to be used whenever it’s needed. So far, batteries are most often used to store solar power. Tesla has teamed up with electric companies in California to build batteries to help them use more solar, but it has not used the batteries for offshore wind power anywhere in the U.S.
Tesla has not said what kind of batteries it plans to use for Revolution Wind, but the large batteries it currently builds, including the Tesla PowerPack, are composed of 16 pods that together weigh more than 3 tons and are 7 feet tall. The pods are daisy-chained together and provide hundreds of kilowatts of power. Tesla declined to comment. 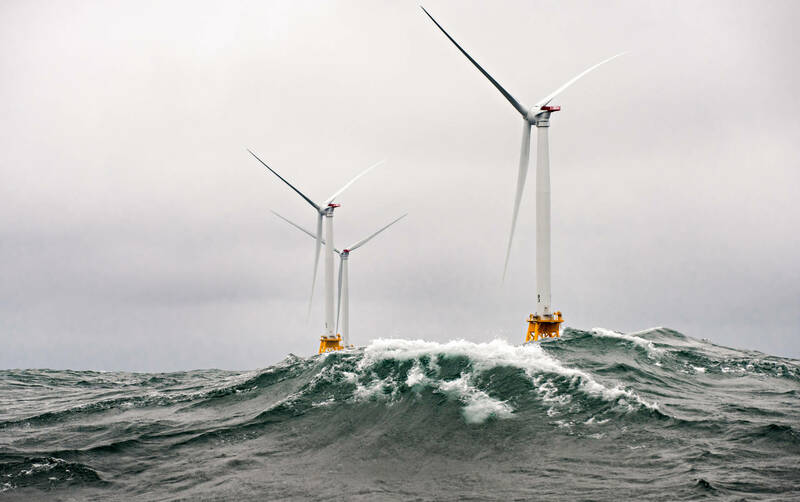 If approved, the Revolution Wind Farm will be built by Deepwater Wind, which switched on America’s first offshore wind farm in Rhode Island last year. That farm lead to the shutdown of a diesel-fired power plant on Block Island. In a statement, Deepwater Wind said the offshore wind-battery storage pairing will provide clean energy during the times of highest electricity demand. The project will prevent the need for new power plants that operate only when power demand is at its daily peak. A spokesperson for the Massachusetts Department of Energy Resources said he had not seen the proposal and was unable to comment.